Laying flagstone patio on concrete requires following several basic steps. With a little work and some attention to detail, you can create an outdoor living space for socializing with friends and family. 1. 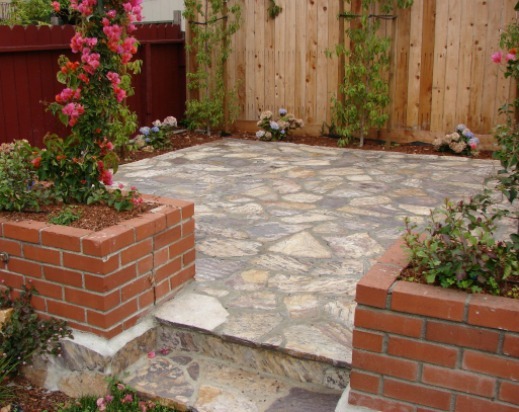 Divide your paving stones into three piles: small, medium, and large. 2. Thoroughly clean your cement slab. A mild muriatic acid solution or a garage floor cleaner will do when removing oil and dirt from your site. Be sure to rinse the surface completely. 3. Mix the mortar so that it is wet enough to apply to the concrete while still remaining stiff. 4. Spread out mortar and begin placing your stones, trying to keep a uniform joint width. Work with the stones until you have a pattern you like. 5. If you want to cut a stone, score a ½ inch line in the stone with a grinder and then try to break the stone along that seam with a chisel, but don’t expect a precise cut every time. 6. Begin setting your flagstones with the thickest ones being laid down first. 7. As you set your stones, try and make sure that they are level with one another. In fact, stop after every 2 or 3 stones and check the level so that you can make amendments before the mortar thoroughly sets up. 8. Twenty-four hours after bedding your stones, use a trowel to fill the gaps between the stones with more mortar. Once dried, sweep away the detritus. You may also fill the gaps with crushed stone if you prefer. 9. If you want, you may now apply an acrylic sealer to keep the stones clean. Laying flagstone patio on concrete will produce an outdoor room that can accommodate a range of activities including alfresco dining, recreation, and quiet relaxation. In addition, a patio built on concrete can be kept clean with less effort than a similar structure set in soil, which means more enjoyment with less effort.